These exciting new UV sterilizers were designed to work with today's low amperage pumps and high flow filters, such as the AquaBead line. 316 Stainless Steel- not 304 like most stainless units. Long 12' cord or longer by special order. 4" Diameter keeps the water close to the lamp for maximum kill in a single pass. 4" Diameter vessel is the perfect size for no restriction flow. Lamp changing is easy - takes only minutes. Pressure switch bypass button equipped for easy testing of lamp and ballast. ZAPP 20.....43 in. tall....for ponds up to 20,000 gal. 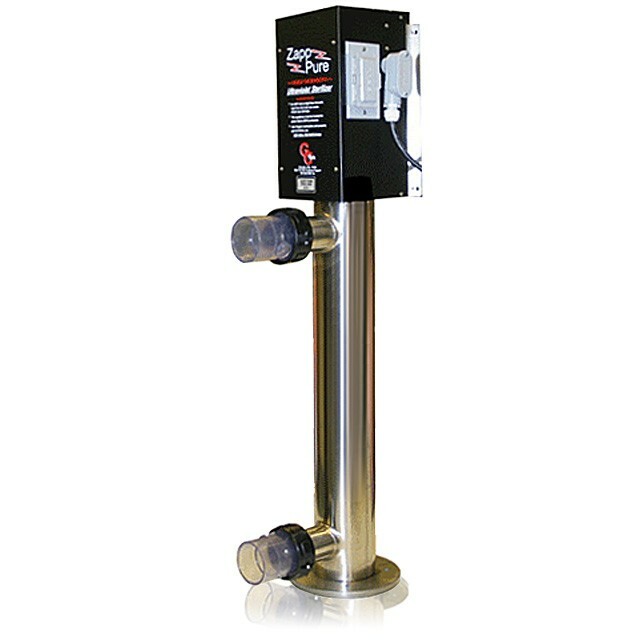 with optimum flow rate of 6000 gph.